Hello, Monday readers! I hope your weekends were wonderful. Mine was pretty good! I’m going to start this post off with a tummy update. I have been experiencing nausea, stomach cramping, and other GI stuff off-and-on for almost three weeks now. After my first two frustrating doctor’s visits (during which I was told it was a virus), I finally had a third appointment with my regular doctor. It’s been a lot of waiting for test results, but I’m happy to report that I’m that much closer to an answer to this whole mess. I was just hoping to test positive for SOMETHING and I got a call on Friday afternoon reporting to me that, low and behold, I had. My tests revealed the presence of a bacteria that can cause the on-and-off symptoms I’ve been experiencing and there is an antibiotic that can treat it. I immediately felt flooded with relief. I honestly was going to be panicky if my tests had shown nothing wrong. Images of being a Dr. House impossible-to-diagnose case have been flashing through my mind. Of course, if this fine man was treating me, maybe I could keep a positive mindset. Source. The antibiotics that can treat this bacteria tend to have side effects of even worse nausea though, so my doctor does not want to put me on them until they get the last of my test results back (hopefully on Monday). Once it’s confirmed that I have tested negative for everything else except this one bacteria, I will be treated for it. They don’t want me on these antibiotics unless I have to be, especially since it is so important for me to feel the best I possibly can so that I can get in the calories I need. I understand that for sure, but am also anxious to start the medication so that I can be sure that this bacteria really is what is causing my symptoms. I was so excited to test positive for something that I didn’t catch the name of the bacteria or meds when I was on the phone with my doc – oops. I will try to get them from her today and report back to you guys. Now onto the subject of this post! 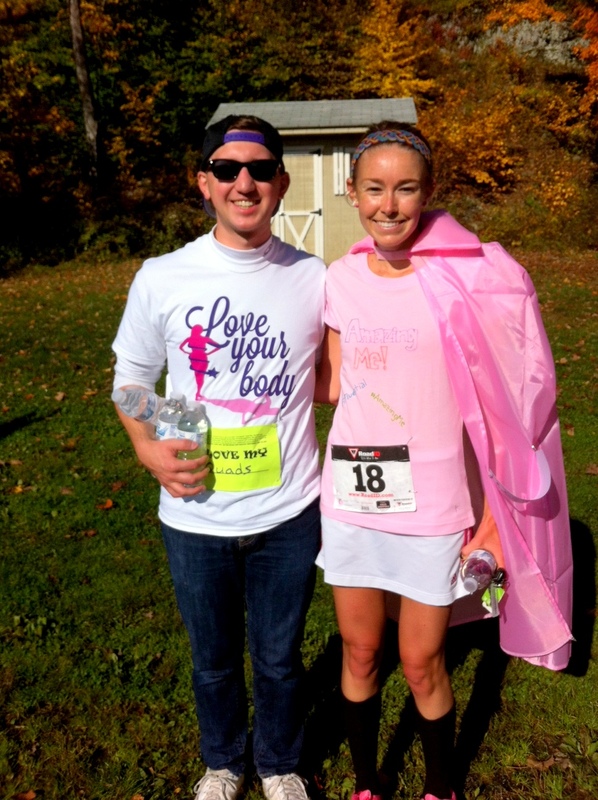 Awhile back I announced that I’d signed up for the CT Chapter of the National Organization for Women‘s Love Your Body 5K at the West Hartford Reservoir. I’m thankful that my good blend Maria was game to sign up with me; together we formed Team #AmazingMe! I could hardly believe race day was already here when I woke up Saturday morning. Unfortunately my stomach was not 100% upon first waking but I rested at home for a couple of hours, drank up an apple cider vinegar and water “cocktail”, and popped an Imodium before I hit the road. 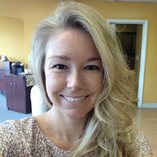 I’m one amazing, Fitfluential lady! 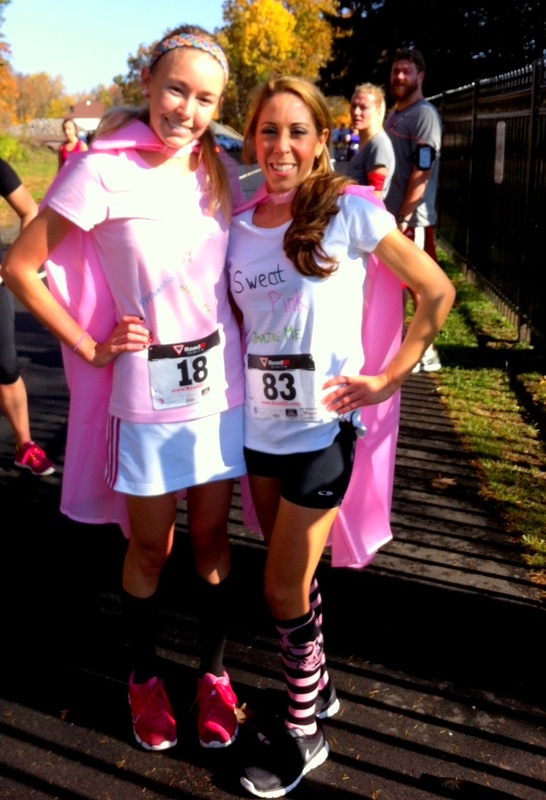 Since the race took place so close to Halloween, Maria and I immediately wanted to plan matching costumes. 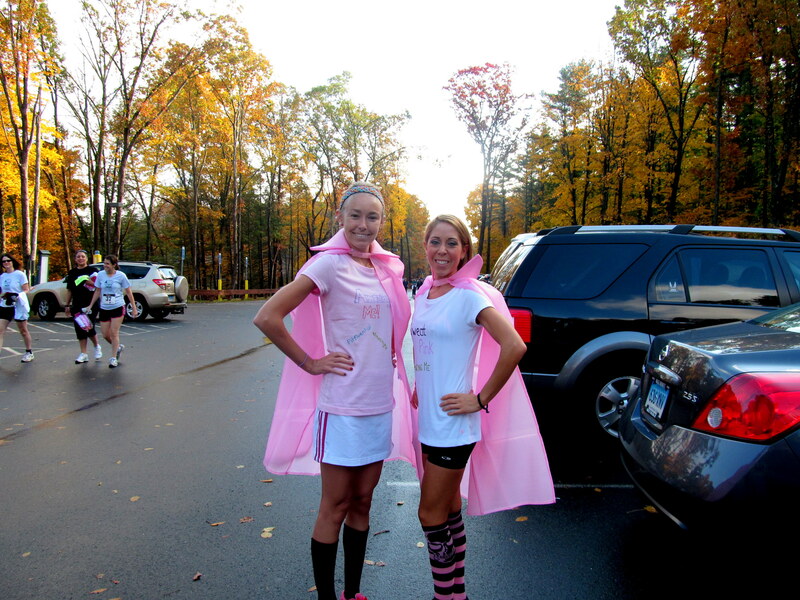 I decided that pink superheroes would be perfect for us. We love our pink and it fit perfectly with our team theme! I got a couple of fairly nice tech tees from Wal-Mart, and we decorated them with Sharpies before the race started. I represented the team name and Fitfluential on my tee, while Maria represented the team and Sweat Pink, for which she is an ambassador. 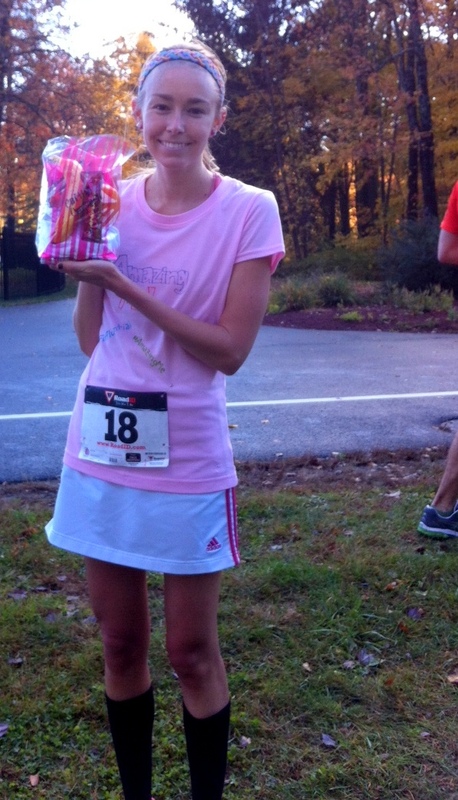 I loooove running skirts – and hot pink sneakers! Also wore my beloved Sweaty Band from the Fitness Mag Meet & Tweet swag bag! 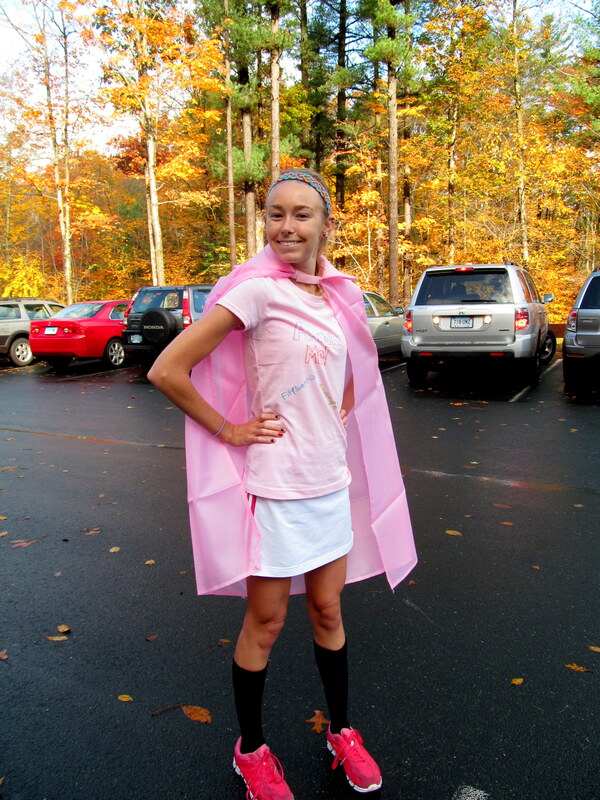 I couldn’t believe Maria was able to find pink superhero capes, but she did! Actually, I think they were supposed to be pink vampire capes, given the classy collars. 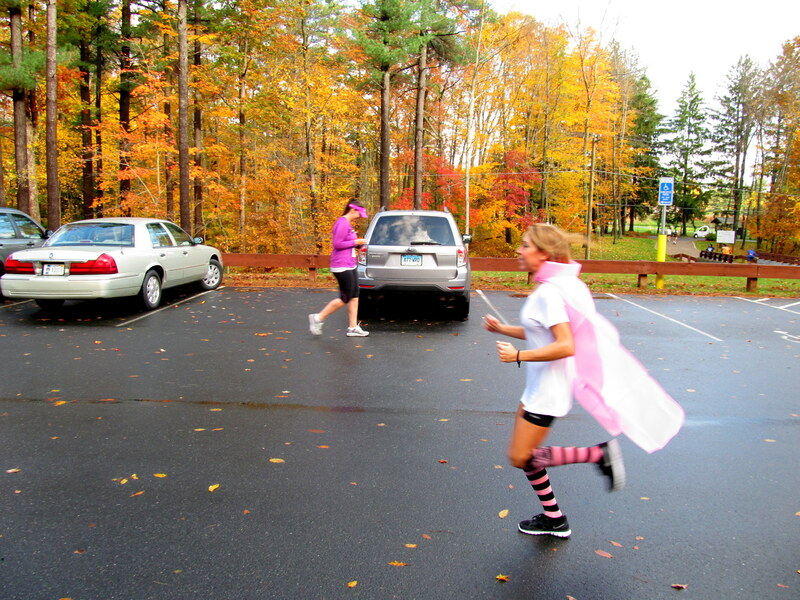 They still fit our purpose and everyone understood that we were supposed to be superheroes – with the exception of one little girl cheering for me at the finish line saying, “GO ballerina, GO!” OK, ballerina works too! Maria testing out the cape after first putting it on. How much do you love her socks? The cape passed the test! After getting “dolled up”, we made a porta-potty pit stop (bleh) and picked up our numbers. 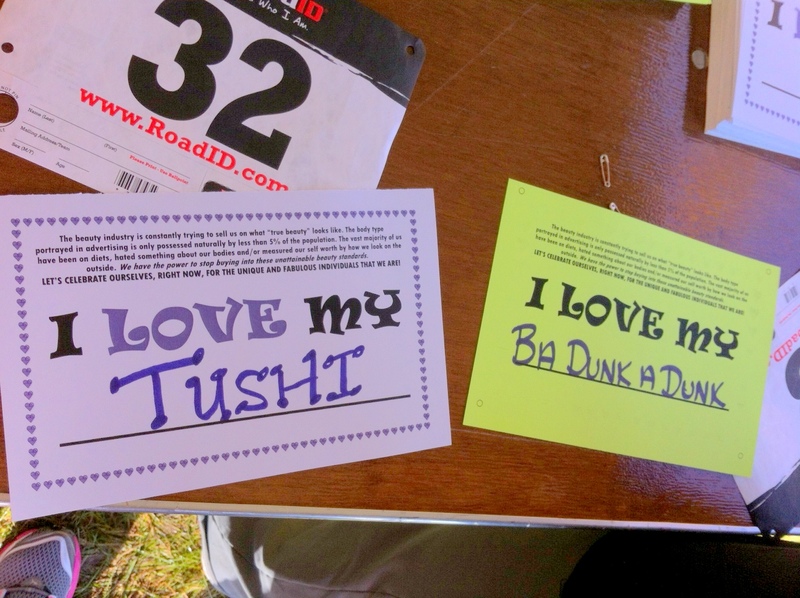 The cherries on top of our costumes were these awesome signs that were available to fill out before participants proceeded to the starting line. Not ours but I sure liked these ideas! Maybe the vampire collar was going to my head. Maria went a similar route! We decided to start out running together, but if one of us picked up a faster pace, she was of course free to move forward. Immediately I started out feeling pretty good and surged a little bit ahead. I still carefully monitored my stomach – at the first feeling of nausea, I planned to scale it back. Thanks for this great pic, Maria! The race course was gorgeous. 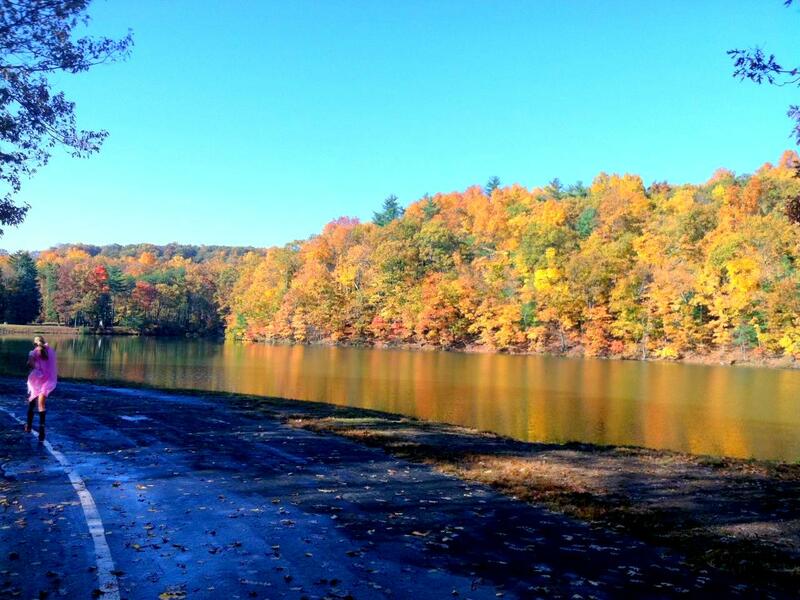 The West Hartford Reservoir is incredibly beautiful and I had only gone running there during the summertime. The sight pictured above truly took my breath away. As I ran by each lake-and-leaves scene I felt overwhelmed by the beauty before my eyes and I truly felt a wave of “zen” wash over me. It’s amazing what nature can do! Our costumes were a huge hit! A lot of people I ran by smiled and cheered for me, saying, “Nice cape!’ I think I need to just wear this costume every day of my life because those smiles certainly made me feel great. The cape stayed on well despite the fact that it was only secured around my neck by one piece of velcro! Unfortunately as I was going down one of the last big hills of the course, I got a REALLY bad stitch in my side. Maria came up behind me and stopped to check on me, advising me to massage the cramp. I did so while breathing out for as long as I could (I heard that this helps side cramps) but did have to stop and walk. For a second I felt disappointed in myself, especially as the folks I’d previously passed were passing me. However the feeling quickly passed. 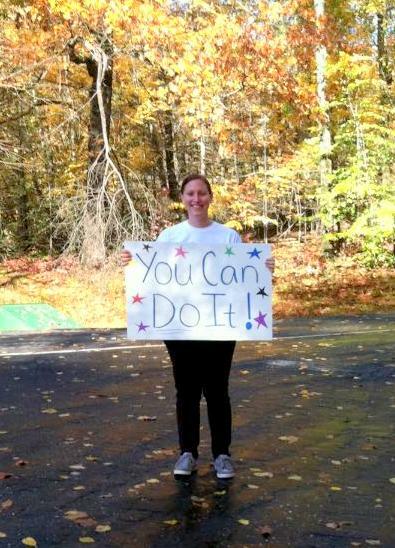 I mean, I have not been feeling my best and here I was running a 5K! My body needed walking and I gave it just that. As I neared where I knew the finish line was I felt confident that the cramp had passed and picked up the pace to a jog, and then a run. Once I was close to the finish line I saw that the clock read 29:40. In the back of my mind I’d had a goal to finish this 5K in under 30 minutes, so I broke into a sprint and crossed at the (unofficial) time of 29:54. Amazing Me indeed! My friend and former co-worker Brian was working at the finish line and handed me a water bottle. He is the one who told me about this event and I am so grateful that he did! It gave me a chance to donate to a cause I believe in, feel inspired, and hang out with a good friend in a beautiful setting. Thanks Brian! He loves his quads! The post-race swag was quite impressive! The shirts actually fit well and I am wearing mine today at work. I love representing a race or event in the workplace – yay for a casual dress code in my office! 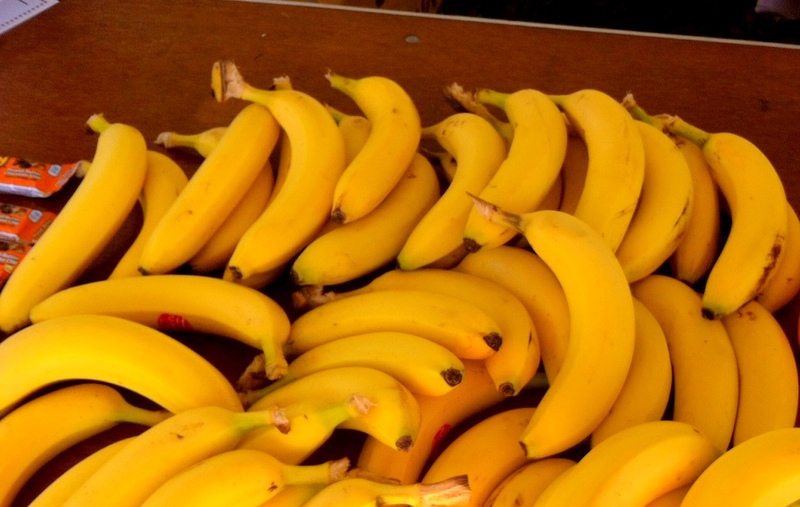 However the very best part of the swag was, to me, the fact that they offered bananas of varying ripeness. 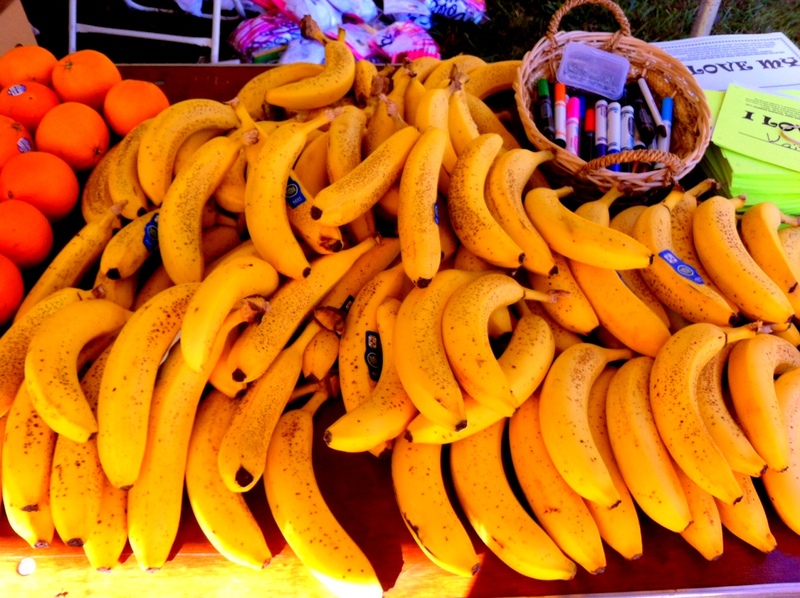 I have never seen that before…there were both plain yellow and brown-spotted bananas. Most people are very particular about their banana ripeness and I don’t know if it’s just me but I was seriously blown away that there was a choice for runners! …and brown-spotted too! This was my choice. Maria and I also snagged some natural lip balm, White Chocolate Macadamia Luna bars, oranges, and Chewy bars (you’re welcome, little brother). Me with my swag bag! 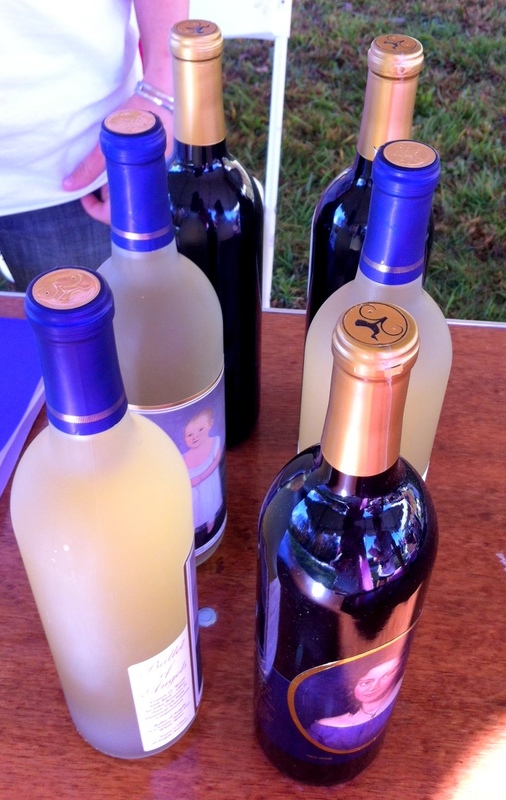 Something else caught my eye at the swag table…local CT wine?! Turns out the top three male and female finishers each got a bottle. I joked that if I had known, maybe I would’ve picked up the pace a bit 😛 and suggested they gift the only costumed runners with wine as well. I got a “maybe next year!” in response to that. Nice try, Caitlin. Unfortunately after we got to our cars, Maria and I had to part ways. She had errands to run and a best friend’s birthday to prep for, and I had (still have…) a paper to write. But I left happy that I’d seen her, proud of myself for walking when I needed to, and pleased that I was still feeling good in the tummy! Oh, and extremely grateful for such a WARM October day. Seriously, I don’t mind this part of global warming. 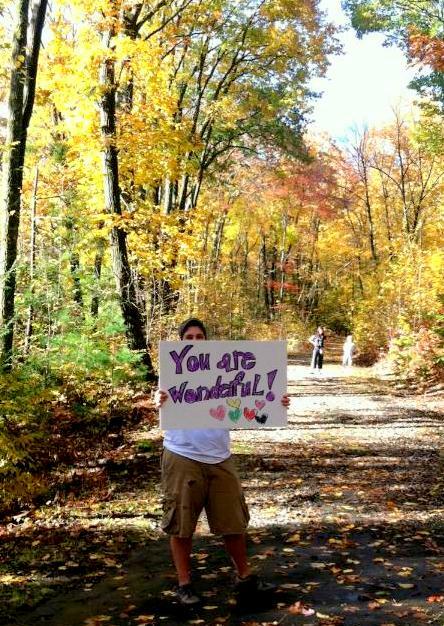 Thank you to the CT Chapter of the National Organization of Women for putting on a great event with an inspiring message! Have you ever dressed up for an athletic event? What was your costume? 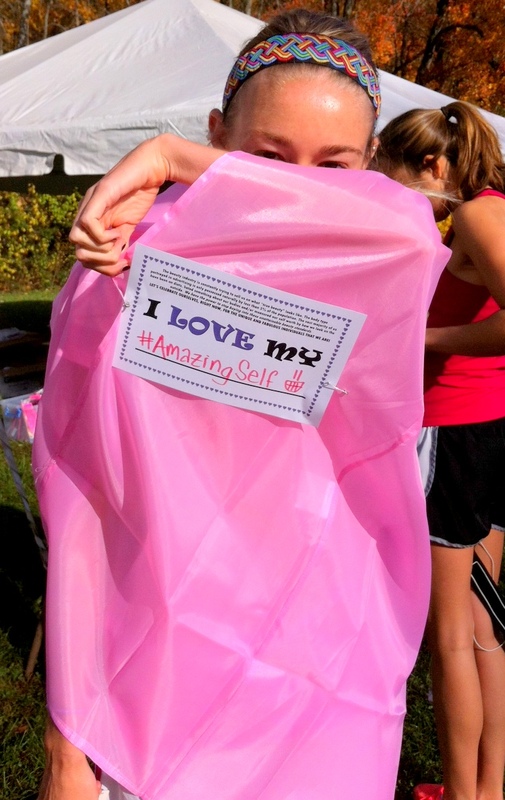 Have you ever participated in a love-your-body centered event? Did it inspire you? 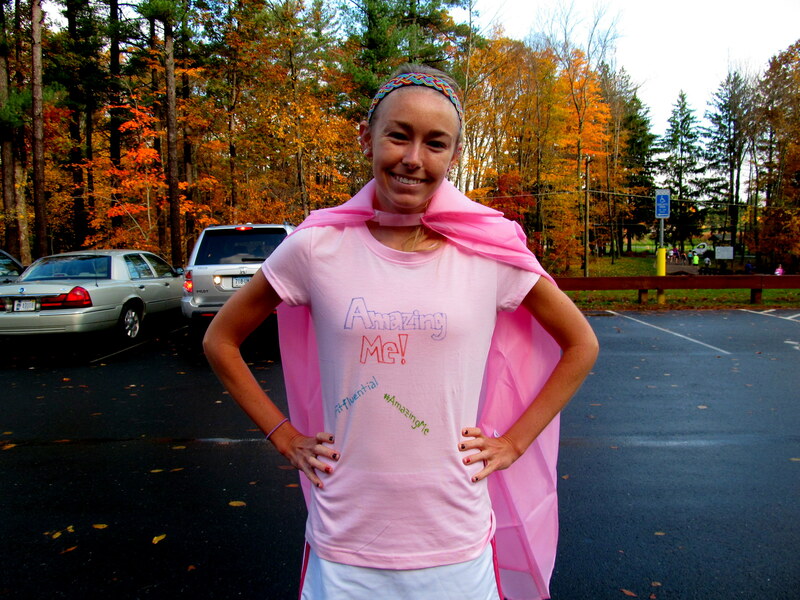 What’s the best race swag/tee you’ve ever gotten?